This will be a week long summer holiday and residency in a historical Franciscan Monastery, in the Bohemian region of the Czeck republic. The Monastery is placed in the little village of Bechyne, over viewing the valley of the river Lužnice, surrounded by its terraced gardens and natural landscapes. This captivating environment offers a special opportunity to focus through play and physical transformations on our creativeness and self awareness. We will engage our sensorial and emotional perception towards ourselves, the others and the surroundings through contact improvisation, tango dance, martial arts forms, voice work and elements of physical theatre. We will work in the interior spaces of the monastery, in the terraced gardens and in the nearby river and forests, articulating creative compositions that come from within that dialogue, allowing the social and natural environment to resonate on us. Using play, sounds and songs, objects, lights, masks or stories, we will develop a parade of different energies and characters, relating, sharing and exchanging them. All these activities will allow us time to enjoy a creative distance with our own selves and to awaken our awareness. This aliveness will gives us the energy to experience, deconstruct and reassemble, thus opening doors to deeper expressions of the self. In the end of the week we will share our work with our friends, guests and Bechyne villagers through an open performance. This performance is not at all compulsory and each one is invited to participate in the way she/he feels like. The monastery is a gothic jewel reconstructed in the 15th century by the Franciscan order together with the church of the Assumption of the Virgin Mary. In this way, it is purposely combining masculine and feminine elements, offering to its inhabitants a symbolic spatial completeness. In the centre of the building there is a courtyard; a symbolic womb from which all living beings and creatures are born. It is surrounded by a windowed corridor with a unique vaulting, which gives it a surprisingly acoustic resonance. This was the place where the monks used to walk, sing and meditate. The entire building is surrounded by what had been in the past the vegetable gardens and orchards and now are the terraced gardens that overview the river and the valley. The river flows besides the village and into farmlands, and natural parks. The Monasterys spatial design and its location seem to metaphorically express the nature that is within and around ourselves. It makes it a special place to rediscover our connection to our primordial natural and animal energies and acknowledge our empathy with all that is a alive. Every day From 10 to 1.30pm – elements of tango, contact-impro, physical theatre, rhythms, sounds & songs communication. 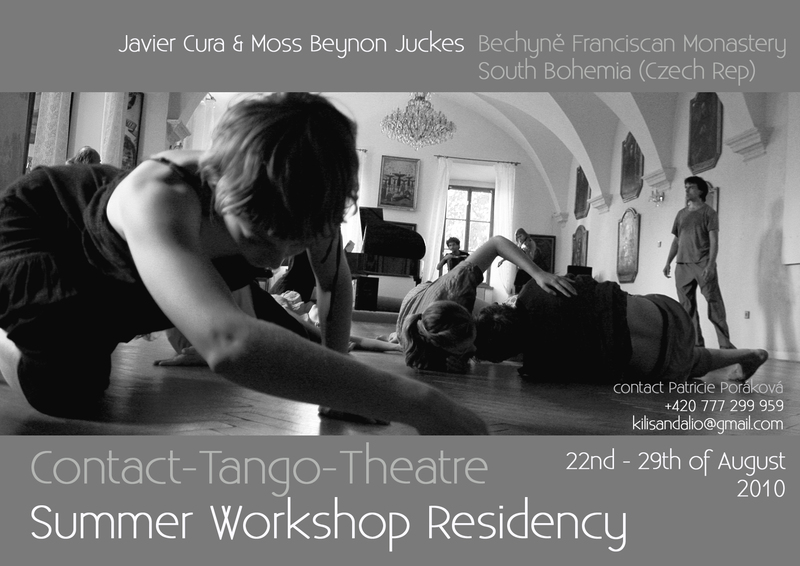 From 6 to 9pm – shared composition work with the guide and assistance of JavierCura & Moss Beynon Juckes. Short jams. The time schedule might be modified following group needs & agreements. Saturday 28th : open evening and night performance . Javier Cura is an argentine american multidisciplinary artist. He completed his Masters in Modern Literature at Buenos Aires University (Argentina). He then dedicated himself to the Fine Arts and held several art exhibitions of objects, sculptures and installations in Bs.As, Arg. He has performed, directed and created dance theatre shows in Argentina, Colombia, USA, Italy, Germany and Indonesia. He presently teaches contact-tango, physical theatre and contact-improv internationally and regularly visits England, Italy, France, Czech Rep., Germany and Argentina. He has been invited to teach at ZIP Contact Impro Festival at Orvieto, Italy, at the Freiburg Contact Festival in Germany, at Alchemie Tango Festival in Prague, at the West Coast Contact Impro Festival, San Francisco (USA) and at Phantastango Tango Festival in Germany. His last piece that merges tango and contact in a physical-theatre context was presented in Prague, Dance Theatre Farma Festival, in Italy Terni Festival and in Mar del Plata, Argentina. In 2009, he was invited by Fabrik Potsdam Dance Theatre Festival to create a Physical Theatre and Tango show with participants of his workshops. He is currently living in Berlin where he is conducting a research on Contact Improvisation expression at the Berlin Free University. Moss Beynon Juckes is a songwriter and dance/theatre performer born in Sydney, Australia and raised in the U.K. She is currently living in Berlin. Since having finished a BA in Dance with Theatre and Live Art at Roehampton University she has branched into experimental and socially inclusive theatre and has studied and performed in Wales, Poland, Czech Rep, Denmark, Brazil and Italy. She has performed with touring companies such as Para Active, The Clod Ensemble, Oily Cart Childrens Theatre and The Folkloric and Artistic Troupe of Dhalaristan. She has performed theatre works Disguarded and Product 1 with her own ensemble Hand to Mouth. She has been leading workshops in music, dance and theatre workshop leader and has worked for Taru Arts and The Workshop Network and has been collaborating with Javier Cura. They have worked on movement therapy research for Sickle Cell Disease, international workshops and community performances. She is currently recording her first Album and has toured Italy, and played festivals such as The Secret Garden Party Festival, 2000 Trees Festival and Glastonbury as a solo artist and as part of a band in the U.K . She has also co -directed a music collective called Beatroot Rendezvous; a platform for original songwriters. Cost includes accommodation in shared rooms of two or three people in the atic of elementary school, a 5 min walking distance from the Monastery. Food is not included in this fee. There is an enormous Kitchen for the group which often cook together and cheap good restaurants nearby. If you are paying from outside Germany make a EU-Standard-Transfer (which should have no cost). Very Important, add the reason of payment: BECHYNE and Your Name.